You know when you make something off the cuff and it's tastes soooo good, but then you try and try to recreate it and you can't? That's what happened this vegan pesto recipe. I made it when I was in Vermont a few weeks ago, didn't measure, didn't keep track of what I was adding and it turned out to be the best damn pesto I've ever tasted. Tried to recreate it the next day and fail. Since then I've made at least five batches and finally, finally I have it down. 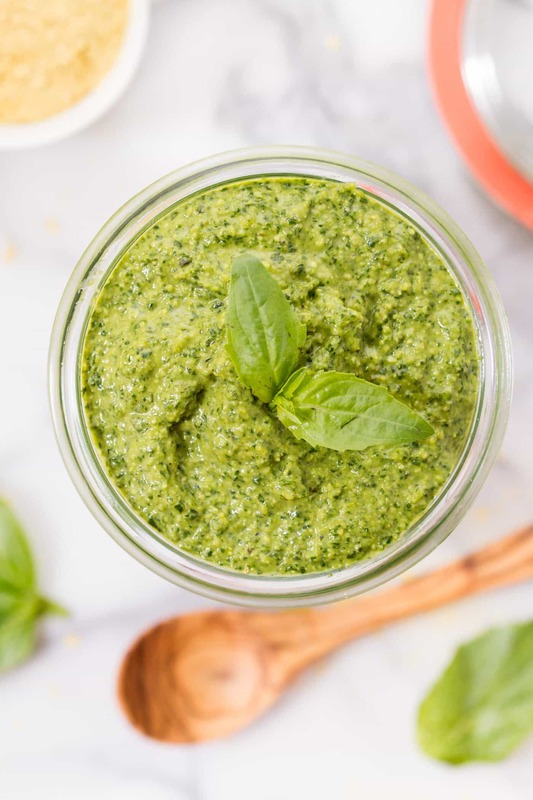 I've made my fair share of pesto recipes here on SQ including my quinoa pesto, my hemp seed pesto and also that raw avocado pesto, but while each of those are super delicious, this pesto is more traditional. It goes with everything and has that familiar pesto taste just without the parmesan cheese. 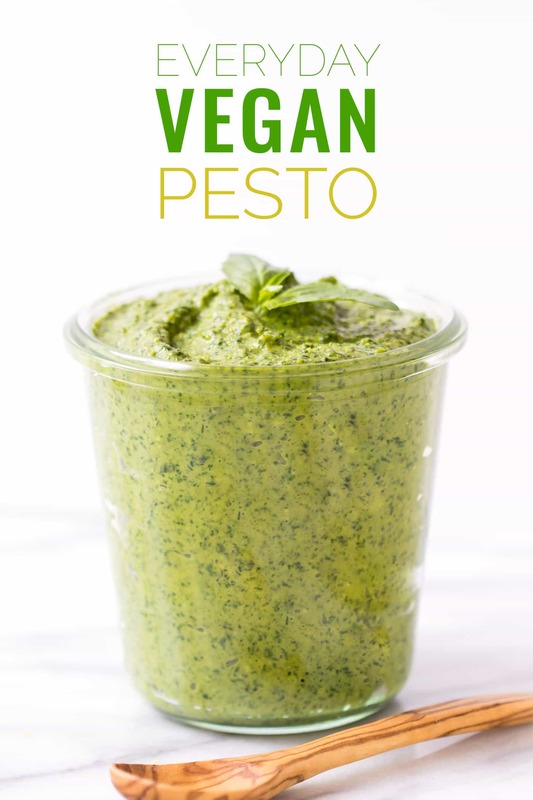 It's the perfect vegan pesto for everyday. To make this pesto vegan, we're swapping in nutritional yeast for the parmesan/romano cheese. It adds that sharp cheesy flavor, with a hint of salt and I swear, if you were to compare this recipe side by side with a dairy one, you'd be hard pressed to tell them apart. Where can you find it? Most natural food stores sell nutritional yeast in bulk, but if you can't find it locally you can get a great price on Amazon! 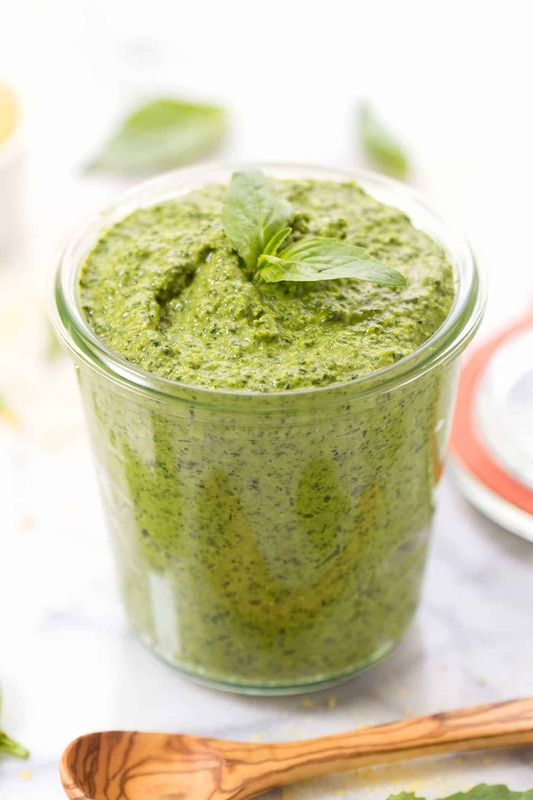 All you need to make your pesto is a food processor. You simply add everything in, blend it up, then drizzle in your olive oil. It seriously couldn't be easier. 1/4 cup pine nuts or walnuts if you don't have/can't find pine nuts, although I just saw you can get raw ones on Amazon for a great price! Add everything aside from the oil into a food processor. Process until combined. Place the lid back on and with the food processor running, drizzle in the olive oil. Start with 1/4 cup and add more if you need it. Scrape down the sides a few times and process again until smooth. Transfer to a glass container and store in the fridge for up 5 day or the freezer for up to 6 months. Want more sauce + dip recipes? What can I use as a hemp seed replacement? More pine nuts would work! I wonder if avocado would work instead of the olive oil with maybe a little water?! To still get the creamy and richness the olive oil brings but just avo instead! 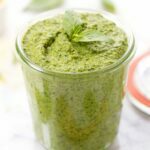 I love this Pesto recipe. And I would love to feature it in our website, GreenThickies. I won’t be posting the actual recipe. I will only post a small snippet and one image from the post, and give credits back to you and link back to the recipe page. Would that be okay with you? I’ve only tried pesto in salads, but I’ve never actually tried making my own! It looks so delicious! I wonder if replacing oil with chia gel would work. I will give it a try when I make this! Love the use of nooch!